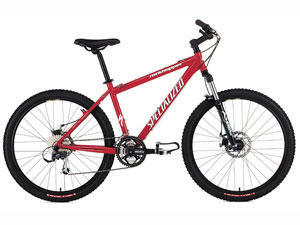 Learner just called with the bad news that his Specialized mountain bike (a $600 gift from his former director) is missing, probably stolen. Last he saw it, it was by their apartment’s backdoor, placed in a corner not visible from the front; in other words, only somebody who knew it was back there or who happened to be wandering in back could have taken it. This makes Learner sad…and angry. It’s what he gets for trying to trust people, he says. It’s what he gets for trying to hold his possessions with an open hand, daring life to either confirm or negate just how much or how little he actually is tied to his belongings. But perhaps the lesson that hurts most (even more than the one that you should always lock up your bike even on a seminary campus) is that it is indeed a fallen world. Learner says he’s getting really tired of learning that one on a daily basis. Had Learner seen him steal it, woe to the guy who took the bike, he says. Instead, he guesses he’ll just have to forgive and move on. Learner is skipping chapel this morning to exegete Ephesians 1. Living on campus has afforded Learner and Mrs. Learner the opportunity to sell their red 1992 Cavalier. This leaves them with only their 1996 Honday Odyssey minivan…and no other car insurance, maintenance, or (supposedly) headaches apart from it. “Less is more,” Learner says. That is, until he has to get somewhere. Officially ten (or so) days into the fall semester and it is both glorious and ridiculous in terms of the amount of reading and scheduling required to make things work, Learner says. World-class athletes have no margin for missing work-outs or sloughing off on their diets as their bodies are so finely tuned and affected by even the slightest deviation from their regimen; the same feels true for him right now (minus the world-class athlete physique and the almost humorous idea of Learner on some kind of diet). And yet, he’s loving it as it really feels like what he thought graduate school/seminary might. Between Learner and Mrs. Learner, they have 19 hours, but even with homeschooling their four children, this has seemed fairly manageable (even fun). If they’ve felt any struggle with schedules right now, it’s been because of random external circumstances (day-and-a-half membership class at church this past weekend combined with Mrs. Learner’s parents being here; the family gearing up to go to the farm next weekend so the children can experience the local Apple Festival, etc.). After next weekend, Learners says he thinks they’ll be able to hunker down and be okay. Papers – not so much writing them but researching them (it’s been a long time, he says, and he’s not sure he knows all the rules for the process anymore, especially now that everything’s changed because of the Internet). He hopes to get some time at the seminary’s Writing Center soon for some pointers. Relationships – it’s been good in that they’ve connected with some folks so far, but already Learner says he feels he’s toward the brim of his people-cup, at least in terms of doing more with a few and being cordial and interested in the rest. Being on campus is still a great thing and he loves walking to class and seeing many people whose names he knows (he still remembers what it felt like to be lost in a sea of humanity at his university of countless thousands); however, there are folks he gravitates toward and others he doesn’t, and he’s still figuring out how to think about that. The children – in many respects, he’s as close to his kids as he’s ever been in terms of locale, time, and initiative, and yet they are really beginning to change (his two oldest, especially). Trying to keep track of what’s going on with each of them is requiring some new discipline on his part to evolve his parenting tendencies and let them learn some things in some new ways. It’s good, he says, and he’s learning as they do, but it’s also different, just as everything else about their lives seems to be these days. In general, though, he’s encouraged by the fact that the family is here and that they’re here now – at this stage of their lives – and not earlier or later. God’s timing, he says, has seemed quite right in many respects, and he’s trusting that the sense of that is also the reality of it. While he and Mrs. Learner are far from figuring things out, they are working hard and making the most of the opportunities before them in a way that matches the challenges coming at them. Learner said he had the thought the other day that, if for some reason, someone told him he had a year to live so what would he do with it, his thought was that he’s doing what he wants to do with it now, though that’s not always been the case in the past. All in all, he says, it feels like a really good fit so far, dead or alive. Last night at about 9:15 p.m., Learner was walking home from his Theology and Practice of Prayer class (the last of a long day’s worth) when he looked over at the campus playground and saw a grown man, alone in full motion, swinging on the playground swingset. The sight of this 225-pound adult – legs pumping and head and upper body thrown back for momentum – coupled with the evening’s teaching that prayer need not be long, eloquent, or intense to be done or effectual, caused Learner to stop in his tracks to offer a prayer to God asking for a similar lightness of spirit. Learner and Mrs. Learner were up late last night working on all the online “diagnostics” their professor assigned for Spiritual and Ministry Formation that they have together. In going through the different personality tests and surveys, the thing that struck him is how well they both know themselves and each other and really have come a long way in being intentional and observant in the ten years since they first started thinking about who they are and what any of that might mean. All your titles for him in your email (“husband, father, father, father, father, employee, intern, student”) were accurate (he liked the “father” thing four times – that was funny). He wouldn’t give any of them up for anything (though sometimes the employee thing wears on him because, as a rule, he hates money and the fact/reality that it takes money to live and having to make enough of a living so his kids can eat when all he really wants to do is study to do things that are never going to be big money providers – write books, teach, etc. – can get frustrating). In answer to your question, for him, “guy time” is probably going to have to be “night time,” more specifically after his children are in bed, which is usually around 8 p.m. As he’s gone two evenings a week (Monday and Tuesday) already for classes, he says he wants to make sure he can be around to help Mrs. Learner put the kids down for bed as much as he can (bedtime can be a nightmare sometimes, though it’s getting better). Being the good INTJ that he is (ever-increasing on the Introvert-side of things, he found out taking the test again last night), he’ll occasionally need some initiation to do something outside of the norm of his schedule, as he’s not one to frequent too many bars if left to himself. A word on “to do something”: it doesn’t have to be much, and frankly, he’d prefer that it not be. Coffee/tea somewhere, or a walk around campus or a park to pray, a museum or anything else that’s cheap and low-key are always his bias. You’ll rarely get him to go out with a bunch of guys just for fun as he’s at a point in life in which he needs/wants a few close friends, and not more acquaintances who he doesn’t even know their last names. This doesn’t mean he won’t or shouldn’t do things in a group setting (especially if he needs to for his internship responsibilities with the church in terms of getting to know people), but these are just his preferences. Mrs. Learner says he’s his own best friend, so read into that what you will. One specific thing that you can help him with is to be periodically thinking about how he’s doing with all the academic hoops he needs to jump through with seminary and higher education in general. When it comes to mandatory processes and paperwork (read: bureaucracy), he doesn’t do all that well trying to keep up with what he needs to file and whose signatures need to be on it. Again, as he learned last night, part of this is preference (he just doesn’t care) and part of it is ignorance (his understanding of higher education as anything more than a goal at this point in time is nil). The time when you drew out the internship process on the board and showed him how to jump through all the hoops once instead of three times was a huge help, not just as an education of the process, but also as a relief that someone else might be able to think about this with him and on his behalf. You know the system(s) so much better than he does. He definitely needs your help there. The other thing that you can help him with is to keep him from becoming too denominational. That may sound funny considering you’re a denominational pastor and all, but one thing that he said he appreciated about you is that you come from a parachurch background, wrote a book with a non-denominational publisher, and seem to have a bit of discernment as to the need not to confuse this particular denomination with being God’s only chosen church. Don’t get him wrong, he says: he likes the denomination and is growing in his love for and understanding of the church as a whole; at the same time, however, he has no desire to become the world’s greatest denominationalist, and he grows weary of all the lingo and, honestly, arrogance that says the denomination has it all figured out (so far, he says, he’s gotten that attitude more from students than professors, but he’s still a little gunshy). Like you, he has a pretty highly-developed crap-o-meter, and he’d rather not have it going off all the time (it goes off enough here at seminary). Other things: of course, you’re always welcome to tutor him in Greek exegesis, but you do have a life. One thing that would really be helpful is if you could give him a 20-30 minute review on the research process you use for paper-writing, etc. Learner’s high school did such a poor job on the basics of that (it’s all changed now anyway with the Internet) and he always made it through college on the strength of his writing rather than the quality of his research, but that won’t happen here. He feels like that’s a potentially big blind spot for him right now, and anything you’d be willing to do to help him there (charts, pulling out your notes to something, showing him how you categorize, organize – just pretend it’s sophomore year all over again and he’s the jock in the class who has to write a paper or he can’t play quaterback anymore) would be really helpful. He supposes that, in general, he needs to feel trusted not only with responsibility but also with relationship. He’s always had more of a mutual friendship with his pastors than just a receiving one – several of them have trusted him with what they “really” think about God, people, the church, etc., and he served them well by being in their corner. He knows there’s no perfect church and he doesn’t think yours is either, and he needs you to not be afraid to process stuff like that with him or “protect” him from it. He was encouraged that you didn’t do that when you first met, and he hopes that can continue. He can be a very loyal friend, a shrewd (in a good way) adviser, and one who doesn’t gossip but who instead knows how to keep a confidence. And, he’s learning again how to pray, slowly but surely. As a rule, he tends to be fairly low-maintenance (to lead anyway), very much a self-starter (and finisher – closure is a drug to him), hates to be micro-managed and patronized, and usually does well enough with correction and confrontation when it starts with facts and not motives. He usually does better when he has too little time than when he has too much time on his hands, and he, like you, hates when stuff is done poorly, which can be a bit hard to live with (just ask Mrs. Learner for specifics on this). I hope some of this helps. Let me know if there’s anything else I can do for you as I’m with Learner quite a bit (sometimes to Mrs. Leaner’s chagrin) and usually have a pretty good idea what he’s thinking about and dealing with. And thanks again for your interest in Learner’s life. It means a lot. Class started on Thursday and Learner has been scrambling to keep up with the flood of new faces, assignments, professors, and ideas coming at him. At first it was almost too much, but after getting some reading done yesterday and getting organized (a practice that does much good for his OCD tendencies), he thinks there’s hope he can handle it, at least for now. It’s going to be a busy fall. I hope I can keep up with him. Two days away from starting classes for the fall, Learner spent a majority of yesterday registering and scheduling, getting all his ducks in a row, and pretending to be in complete control of life (if only in his head and on paper). It felt good, he says. Taking 14 hours this semester, studying 20 and working 19 per week, preparing and teaching a Sunday School class for 10 weeks beginning this Sunday, and trying to be of some help to Mrs. Learner as she homeschools the kids while taking and studying for 5 hours of class herself, it’s going to be a full fall. Last night, Learner had a breakthrough with the children at bedtime. Desperate for a change, he started reading The Chronicles of Narnia to them and they loved it, his oldest (who has been causing most of the trouble lately) especially. He read to them (all four, in their beds, in the same room) three chapters (about 45 pages/minutes worth), and they were, for the most part, enthralled, he says. Personally, Learner says it was a much-needed moment of relief and joy of actually feeling like a father again, and he’s hoping to make this part of their routine in the new fall schedule. The other major schedule adjustment this fall is Learner’s wake and sleep times. He’s always historically done better “early to bed, early to rise” (in college, he and his roommate used to go to sleep at 9 p.m., getting up at 6 a.m., which was somewhat underhead of at the undergraduate level). Thus, he’s making a point to shoot for sleep by 9:30 each night in order to rise at 5 a.m. each morning. “I got the cricket,” he says. “Congratulations,” I tell him. Anyway, Learner says that if he gets to bed early, he thinks he can make it; if not, he has no idea how else to get done what he needs to and still maintain some semblance of time with the Lord (not to mention keep hold of his personal sanity as well). “Now is not the time to be passive in planning. ‘Seize the day’ and all that crap,” he says. In addition to the night’s cricket-killing exercise, he checked his email and got word he actually passed his beginning Greek class (no small thanks to the given extra credit), and is officially heading for Greek exegesis, which he registered for by faith yesterday. He’s motivated (now/again). Help him, God. Be his motivation. Let’s hope so. That’s what Learner’s been praying for, anyway.